Product information "COX (ovine) Inhibitor Screening Assay Kit"
The COX (ovine) Inhibitor Screening Assay directly measures PGF2alpha produced in the cyclooxygenase reaction. 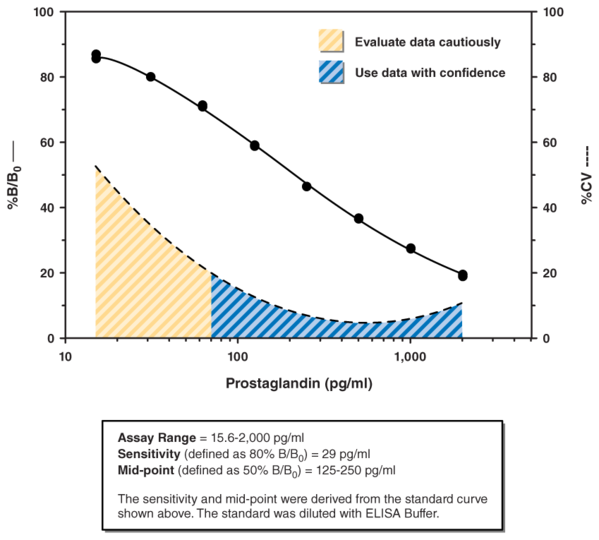 The prostanoid product is quantified via enzyme immunosorbent assay (ELISA) using a broadly specific antibody that binds to all the major prostaglandin compounds. Thus, this Cayman COX assay is more accurate and reliable than an assay based on peroxidase inhibition. The Cayman COX (ovine) Inhibitor Screening Assay includes both ovine COX-1 and COX-2 enzymes in order to screen isozyme-specific inhibitors. This assay is an excellent tool which can be used for general inhibitor screening, or to eliminate false positive leads generated by less specific methods. Customer review for "COX (ovine) Inhibitor Screening Assay Kit"